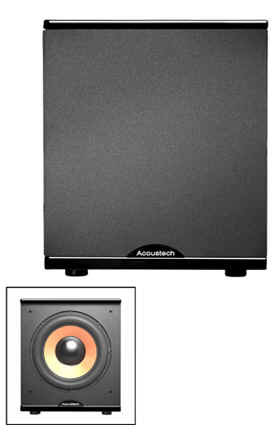 The Acoustech Cinema Series H100 subwoofer fills a room with clean bass that highly enhances music or deep rumbling bass for exciting home theater sound. This subwoofer is a super value. A sleek cabinet with high gloss houses a heavy duty 12" front firing woofer. 500 watts dynamic peak output.